This airticle is aboot the ceety in the Unitit Kinrick. For ither uises, see York (disambiguation). 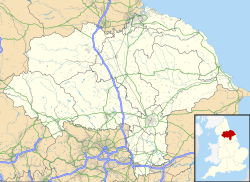 Nickname(s): "Caipital o the North", "Chocolate Ceety"
York (local i/ˈjɔːrk/) is a wawed ceety, situatit at the confluence o the Rivers Ouse an Foss in North Yorkshire, Ingland. The ceety haes a rich heritage an haes providit the backdrop tae major poleetical events throughoot hintle o its twa millennia o existence. The ceety affers a walth o historic attractions, o which York Minster is the maist prominent, an a variety o cultural an sportin activities. The ceety wis foondit bi the Romans in 71 AD, unner the name o Eboracum. It became in turn the caipital o the Roman province o Britannia Inferior, an o the kinricks o Northumbrie an Jorvik. In the Middle Ages, York grew as a major oo tradin centre an became the caipital o the northren ecclesiastical province o the Kirk o Ingland, a role it haes retained. In the 19t century York became a hub o the railwa netwirk an a confectionery manufacturing centre. In recent decades, the economy of York haes moved frae bein dominated bi its confectionery an railwey-relatit industries tae ane that provides services. The University of York an heal services hae acome major employers, whilst tourism haes acome an important element o the local economy. ↑ Andalo, Debbie (26 March 2008). "Head to the capital of the north". London: The Guardian. Retrieved 30 September 2008. ↑ "The Chocolate City". York Press. 1999. Archived frae the oreeginal on 23 May 2010. Retrieved 30 September 2008. ↑ 3.0 3.1 "Key Figures for People and Society: Population and Migration". Office for National Statistics. 2010. Retrieved 11 March 2012. ↑ "Timeline". Visit York. York Tourism Bureau. 2005. Archived frae the oreeginal on 8 January 2008. Retrieved 25 October 2007. ↑ "KS01 Usual resident population: Census 2001, Key Statistics for urban areas". Office for National Statistics. Retrieved 11 March 2012. Wikimedia Commons haes media relatit tae York.